Being in the plumbing business in Ft. Lauderdale for over 25 years, we’ve heard some interesting ideas from our customers about how plumbing works and how to take care of plumbing problems. In some cases these “ideas” have been passed down over generations, others are original and all most all of them are wrong. Lemons and egg shells clean garbage disposals. Not really. A lemon rind may make your disposal smell better but the idea that lemon oil in the rind helps clean the garbage disposal is simply not true. Some people think that egg shells work as a natural abrasive and scrape the garbage disposal blades clean. What egg shells are more likely to do, particularly if you try to cram all the shells from a four person breakfast down, is clog the disposal. The correct way to clean a disposal is to disconnect the power, pour mild dishwashing soap into the disposal and then use a long handled brush to lift the grease and material. Reconnect the disposal and run hot water through it. 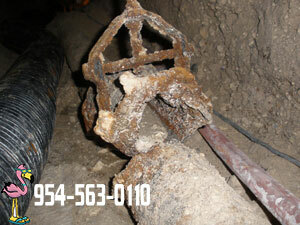 Disposals can handle almost anything so long as there is water running to help the material down. It doesn’t matter how much water you run, a disposal will not correctly process thick or hard food items like banana peels, steak gristle, chicken bones and fish bones. In fact you could be setting yourself up for an expensive repair as those items can damage a disposal. So long as the water isn’t backing up the disposal isn’t clogged. While it’s true if the water in a disposal is draining there isn’t a function stopping clog but that doesn’t mean a clog isn’t about to occur. Watch how fast the water drains and if small bits of material are being left on the intake pipe. If the water is slow a clog is just around the corner and you need to clean the disposal and check the trap. Your garbage disposal is not indestructible and a clogged or jammed disposal can be a major inconvenience. However, if you find yourself with a clogged or backed up garbage disposal it’s nice to know that we offer emergency plumbing service 24/7. Give us a call and we’ll be on your doorstep shortly!